Home > Found an Injured Marine Animal? 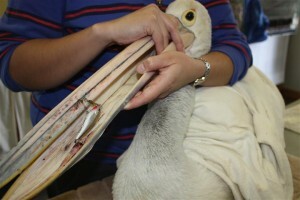 > Found an Injured Seabird? Q. What should I do before physically touching this animal? Q. Can other people assist with this rescue if I am asked to catch the bird? A. Yes, providing they are not small children and are quiet when doing so. Be sure you protect yourself (face and arms) from the beak and claws as these animals will consider you a predator and they may strike at you without warning. Keep all other people, dogs and children as far away as possible at all times as this will stress the animal and make it harder to capture if they are close by. When catching a seabird it is very important to control the head (beak) and wings first (in that order). Once caught, cover the birds head with a towel or shirt and stay calm, do not shout or yell whilst the bird is in your arms, this will add to stress levels. If you are able to; place the bird in a box and keep it in a dark, warm and quiet place (bathroom, spare room or shed (providing it’s not over 26 degrees)). Do not attempt to feed this animal unless advised by an AMWRRO official; you can place a small dish of water in the box with the bird if you so choose but this is not necessary. Please keep children and dogs away from this animal at all times as they too are considered as predators and will increase the birds stress levels. Stress is extremely important to keep at an absolute minimum at this point in time as an increased stress level can and will kill this animal if mistreated.